VITALITY METERS ABOVE 100% WILL LOOK ODD UNTIL THEY FALL TO 100% OR LESS. oversized monsters with their "zords." 'Nuff said. But it is worth to play it, if you are the fans of that TV shows. This game is very easy. I beat it in 30 minutes. (Thats the first time I played it) I can manage about 20 minutes now. If there was a top ten list for easiest games, this one would be near the top. Hmmmm, how did the programmers get away with just using one type of enemy to fight per level!?? And some are black and white! Fairly good fun - especially in the robot sections, but otherwise quite dull and repetitive. Good graphics and music tho'. 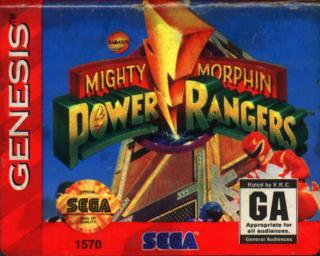 Mighty Morphin Power Rangers is the most Best fighting Game in the whole World. It should Be Re-Released for Playstation 2, X-Box, Nintendo Gamecube, & game boy advance. 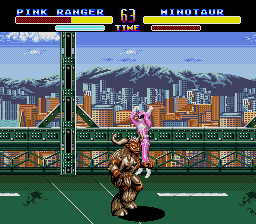 on Arcade Mode you can Battle Rita Repultsa's Monsters by Choosing A Power Ranger you want including the Red Tyrannosaurus Ranger, the Black Mastodon Ranger, the Blue Triceratops Ranger, the Pink Pteridactyl Ranger, or the Yellow Saber Tooth Tiger Ranger. If you want to be the Green Dragonzord Ranger & his Zord the Dragonzord You have to Beat Him & his Zord To Stop Rita Putting Spells On Him & His zord. If Rita Makes her Monsters Grow with her wand, You have to Summon the Dino Megazord If You are any Power Ranger like Pink, Yellow, Blue, Black, or Red. You have to summon the Dragonzord that If you Chose Green. 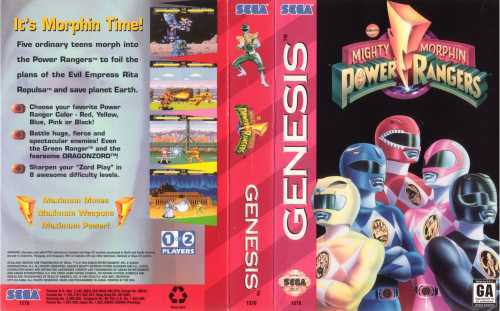 In the final level you have to Choose the Dino Megazord Or the Dragonzord. After You win the Final level the Power Rangers Form the Megazord, Dragonzord, & Titanus to the Dino Ultrazord & Destroy Ritas Castle & its the End. 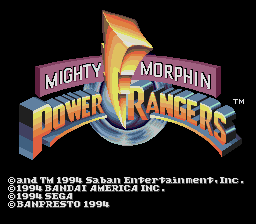 i like the morphin's power rangers i like the movie that i want the game to play so please i'm pleading in the almighty lord if only you can send me a game with power rangers cartridge i would like it very much and a great thanks to you. i will also like to be a member of this web. is this game like streets of rage? this game is very good!